LAWRENCE, Mass.—Sen. Elizabeth Warren (D., Mass.) officially entered the 2020 presidential race on Saturday, painting a dark picture of a country beset by political corruption and a system where everyone who isn't rich is kicked to the side. Her campaign, Warren said at Everett Mills on a sunny, chilly morning, is about bringing "big, structural change." "This is the fight of our lives. The fight to build an America where dreams are possible, an America that works for everyone. I am in that fight all the way," she said. "And that is why I stand here today, to declare that I am a candidate for president of the United States of America." The crowd in the city Warren chose for its historic ties to the labor movement chanted her name and roared. Warren linked the story of the famed 1912 Bread and Roses strike—begun by women textile workers in Lawrence—to her campaign calling for major progressive reforms. She enters a field that's already crowded with other U.S. Senators like Kamala Harris (Calif.), Kirsten Gillibrand (N.Y.), and Cory Booker (N.J.), and could still see the entrants of high-profile figures like Sen. Bernie Sanders (I., Vt.), former Vice President Joe Biden, former Rep. Beto O'Rourke (D., Texas), and Sen. Amy Klobuchar (D., Minn.). The man Warren hopes to challenge, President Donald Trump, was not the "cause" of the brokenness of the country, she said, but rather "the latest and most extreme symptom of what's gone wrong." "[He's] a product of a rigged system that props up the rich and powerful and kicks dirt on everyone else. Once he's gone, we can't pretend that none of this ever happened," she said. "It won't be enough to just undo the terrible acts of this administration. We can't afford to just tinker around the edges, a tax credit here, a regulation there." Warren said the American middle class had been hollowed out and communities of color in particular had been affected. She said the rules against minorities were rigged and specifically mentioned Native Americans. "The middle class squeeze is real, and millions of families can barely breathe. It is not right!" Warren said, with chants of "it's not right" breaking out in the crowd. Warren was introduced and endorsed by Rep. Joe Kennedy III (D., Mass. ), who gave last year's State of the Union response to Trump. Among others speaking on Warren's behalf were fellow Massachusetts Sen. Ed Markey (D.) and Rep. Lori Trahan (D., Mass.). "The good news is no one knows how to get under Donald Trump's skin better than Elizabeth Warren. Donald Trump may have his tweets, but Elizabeth Warren has her peeps," Markey said. 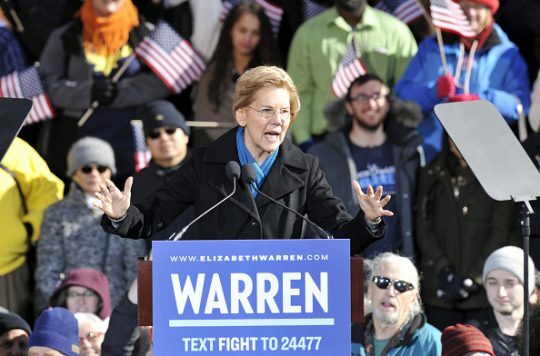 Warren praised the radical Green New Deal resolution Markey rolled out with Rep. Alexandria Ocasio-Cortez (D., N.Y.) and called for liberal reforms on issues like climate change, gun violence, student loan debt, "the crushing cost of health care," and immigration. But her main message continued to be that if you're not rich in America, you're getting screwed. Kennedy even mentioned a "broken economy" in his remarks. "If you don't have money, you don't have connections, Washington doesn't want to hear from you," Warren said. "When government works for only the wealthy and the well-connected, that is corruption plain and simple, and we need to call it out." Warren, who founded a presidential exploratory committee in December, braced herself for the "cowards and armchair critics" as she officially started her run. "We learned a long time ago you don't get what you don't fight for!" she said. Warren gave the speech after a trying week for her nascent candidacy. She apologized for identifying herself as Native American for two decades, after the Washington Post reported on a 1986 State Bar of Texas registration card where she called her race "American Indian." The Boston Globe called on her in an op-ed Friday to get out ahead of any other times she listed her race that way or else see her campaign implode. The Trump campaign was quick to rip Warren over the controversy on the day of her announcement. The Republican National Committee released a video Saturday mocking Warren's chances of winning as "1/1,024," a reference to her DNA test in October showing she could have a Native American ancestor as distant as 10 generations back. "We’ve always known that Elizabeth Warren’s socialist policies were far outside the mainstream," RNC spokesman Michael Ahrens said in a statement. "But Warren’s disastrous handling of her false minority claims and her refusal to apologize until now has everyone, including her own supporters, cringing at her campaign."